In this paper, we engineered Escherichia coli by embedding two exogenous genes encoding a limonene synthase (LS) and a geranyl diphosphate synthase (GPPS) for production of limonene. Out of 12 E. coli strains transformed with various plasmids, the best one with p15T7-ls-gpps produced limonene with a titer of 4.87 mg/L. In order to enhance the limonene production, two rate-limiting enzymes in the endogenous MEP pathway of E. coli, 1-deoxy-xylulose-5-phosphate synthase (DXS) and isopentenyl diphosphate isomerase (IDI), were overexpressed consecutively on vector pET21a+, resulting in a production of 17.4 mglimonene/L at 48 h.
After the preliminary optimization of the medium in a two-phase culture system composed of n-hexadecane (1/50, Vorg/Vaq), the final production of limonene was raised up to 35.8 mg/L, representing approximately a 7-fold improvement compared to the initial titer. Terpenoid, which has more than forty thousand kinds of chemicals, is the largest family of natural products . Limonene, one of the simplest monocyclic p-menthane (1-methyl-4-isopropylcyclohexane) type monoterpenes, has been used as a flavor or fragrance with aroma value ,. Limonene is also an important plant monoterpene precursor of several fine chemicals, flavorings, fragrances, and pharmaceuticals such as carveol, carvone, perillyl alcohol and menthol –. In addition, the hydrogenated form of limonene can be used as fuel . However, the major supply of limonene is limited to plant sources currently. Although chemical processes for monoterpene synthesis have been well documented, very few pathway-engineered processes , have been reported so far for the production of limonene. Therefore, it is promising and attractive to develop a route of microbial synthesis for limonene production. Isopentenyl diphosphate (IPP) and its isomer dimethylallyl diphosphate (DMAPP) are the two essential building blocks to synthesize all isoprenoids (terpenoids). There are two biosynthetic pathways to produce IPP and DMAPP. The first one is mevalonate pathway (MVA pathway) present in all higher eukaryotes such as Saccharomyces cerevisiae– The second one is MEP pathway starting with the reaction between pyruvate and glyceraldehyde-3-phosphate to synthesize IPP and DMAPP ,. Plants produce their terpenoids using MEP pathway, which takes place in their plastids. In addition, MEP pathway occurs in most bacteria including Escherichia coli. Based on the IPP and DMAPP produced from the MEP pathway, limonene can be synthesized by the catalysis of two key enzymes ,, geranyl diphosphate synthase (GPPS) and limonene synthase (LS), which were reported to occur in Abies grandis and Mentha spicata, respectively. GPPS catalyzes the condensation between IPP and DMAPP, forming a linear diphosphate intermediate, geranyl diphosphate (GPP), the precursor of all the monoterpenes. On the other hand, LS catalyzes the intramolecular cyclization of GPP to give limonene (Figure 1). Engineered pathway for (−)-limonene biosynthesis in E. coli. (−)-Limonene was biosynthesized via glycolysis, the endogenous MEP pathway in E. coli and the exogenous limonene biosynthesis pathway. DXS: 1-Deoxy-d-xylulose-5-phosphate synthase; IDI: Isopentenyl diphosphate isomerase. Although overexpression of rate-limiting enzymes in the MEP pathway has been used to produce many terpenoids including isoprene, taxol precursor and levopimaradiene –, this method has not been used in the most common engineered strain Escherichia coli to produce limonene. In a previous study, an engineered Escherichia coli, harboring a heterologous GPPS gene from Abies grandis and a LS gene from Mentha spicata, was reported to produce limonene in a titer of merely 5 mg/L (24 h) . A possible reason for the low limonene production might be the insufficient supply of IPP and DMAPP. In another report, an engineered Escherichia coli in which a heterologous MVA pathway was installed, can produce limonene with titers around 335 mg/L at 48 h .
In this paper, we engineered E. coli to produce (−)-limonene by expressing a GPPS, a LS, a 1-deoxy-d-xylulose-5-phosphate synthase (DXS) and an isopentenyl diphosphate isomerase (IDI). A series of modifications to optimize the expression of those enzymes and the medium have been done. The final production of limonene was raised up to 35.8 mg/L, representing approximately a 7-fold improvement compared to the initial titer. Escherichia coli BL21 (DE3) (Novagen, Germany) was used for gene cloning and expression. Escherichia coli K12 MG1655 was used for amplification of dxs, idi, and ispA genes. The gene sequences of GPPS and LS were obtained from Abies grandis and Mentha spicata (Genbank accession numbers: AF513112 and L13459). These genes were condon optimized for E. coli and commercially synthesized in Generay (Shanghai, China). N-Terminal amino acids at positions 87 and 56 of GPPS and LS (plastid transit peptide) were removed ,. Vectors pET-21a, pET-28a, pACYCDuet-1, pQE30 and pTrcHis2B (Novagen, Germany) were used for gene expression. The PCR fragments of gpps and ls were cloned into the Bam HI–Eco RI and Eco RI–Sal I sites of the pTrcHis2B vector to create p40Trc-ls-gpps and p40Trc-gpps-ls plasmids. The generated ls-gpps and gpps-ls operons from p40Trc-ls-gpps and p40Trc-gpps-ls were then cloned into pACYCDueT-1 vector through Bam H I and Sal I sites to generate p15T7-ls-gpps and p15T7-gpps-ls plasmids. For constructing p40T7-ls-gpps and p40T7-gpps-ls plasmids, initially the operons ls-gpps and gpps-ls were inserted into pET-28a vector at Bam H I and Sal I sites. The ispAS80F, which is designated as Ec GPPS here, is another geranyl pyrophosphate synthase. The method for constructing plasmids p40Trc-ls-Ecgpps, p40Trc-Ecgpps-ls, p15T7-ls-Ecgpps, p40T7-ls-Ecgpps, p40T7-Ecgpps-ls and p15T7-Ecgpps-ls was the same as the plasmids listed above. The dxs-idi operon was initially constructed by cloning each of the genes from the genome of E. coli K12 MG1655. The dxs-idi operon was cloned into pTrcHis2B vector by the Bam H I-Kpn I sites to create p40Trc-dxs-idi plasmid. The dxs-idi operon was sub-cloned into the pQE30 and pET-21a vectors through Bam H I and Sal I sites to construct p40T5-dxs-idi and p40T7-dxs-idi plasmids, respectively. The primers used were listed in Table 1. All plasmids in this study were shown in Table 2, and all engineered E. coli strains and the corresponding plasmids were shown in Table 3. The expression strengths of vectors were estimated using published values of promoter strength and copy number. Promoter strengths were calculated as Trc = 1, T5 = 2, T7 = 5 (Brosius et al. , Brunner et al. ). Gene copy number was assigned by published copy numbers for origin of replication for the different plasmids used. For a full plasmids description, see Table 1. Culture for limonene production was carried out in 2YT medium using a shaking incubator at 20°C and 180 rpm. Glycerol as the main carbon source, was added at 2% (w/v) concentration to all the media used in this study . LB medium and TB medium were compared with 2YT medium as basis media for limonene production. The addition of pyruvate as an auxiliary carbon source has been reported to increase terpenoid production . Ampicillin (100 μg/mL), kanamycin (50 μg/mL) and chloramphenicol (50 μg/mL) were added to the culture as required. Cell culture was carried out in 100 mL of medium, and growth was determined by measuring the optical density at 600 nm (OD600). For the two-phase culture for limonene production, IPTG was added when OD600 reached about 0.7, and 2 mL of n-hexadecane was layered over 100 mL of culture medium. The assay for glycerol was conducted by the Nash reagent . In the two-phase culture system with n-hexadecane overlay, limonene was extracted with the upper n-hexadecane phase. Then n-hexadecane containing the limonene was collected and centrifuged at 14,000 rpm for 10 min. The n-hexadecane extracts were analyzed with GC-MS (QP2010, Shimadzu, Kyoto, Japan) equipped with an InertCap DB-5 ms column. Limonene from splitless 1 μL injection was separated using a GC oven temperature program of 50°C for 3 min, followed by a 10°C/min ramp to 250°C. Injector and MS quadrupole detector temperatures were 250°C and 150°C, respectively. To increase the sensitivity and selectivity of detection, the MS was operated in selected ion-monitoring (SIM) mode using ions of 136, 68, and 93 m/z, which represent the molecular ion and two abundant fragmental ions of limonene. (−)-Limonene can be produced by introducing the gpps and ls genes into E. coli. Previously, IspAS80F has been known to make the ispA variant synthesize GPP only . We cloned the ispA genes from E. coli, and got the IspAS80F gene Ecgpps. Polycistronic operons consisting of gpps and ls or Ecgpps and ls, in which the genes can be assembled as one transcriptional unit, were constructed based on pTrcHis2B, pACYCDuet-1 and pET28a+. Then totally twelve limonene synthesis plasmids were constructed (Table 2) and introduced into the E. coli, respectively. Those twelve recombinant E. coli cell lines, each harboring one limonene biosynthesis plasmid, were cultured in 2YT medium for 48 h. The cells were cultured with 250 μM IPTG induction. As shown in Figure 2, only trace amounts of limonene were detected in the culture of E. coli harboring Ecgpps-ls operon or gpps-ls operon. While the four recombinant strains harboring ls-Ecgpps operon and ls-gpps operon (strain #2, #7, #8 and #9) could produce a quite significant amount of limonene, indicating that the limonene synthase gene should be put before the gene of geranyl diphosphate synthase when they were coexpressed in one plasmid. Moreover, the strain #2 harboring the ls-gpps operon could produce more limonene than the other strains (strain #7, #8 and #9) harboring the ls-Ecgpps operon. This result showed that GPPS was more suitable for monoterpene biosynthesis compared to Ec GPPS. In addition, for the better expression of ls-gpps operon, a moderate expression strength (Table 2) was good for E. coli to produce limonene. We also found that the cell mass was greatly associated with the limonene production (Figure 2, C). This phenomenon indicated that the expression of plasmid p15T7-ls-gpps, which could affect the main metabolism, was conducive to cell growth. As a result, the limonene synthesis plasmid p15T7-ls-gpps was therefore selected for limonene production in further experiments. This optimized limonene pathway plasmid could lead the recombinant E. coli to accumulate 4.87 mg/L of limonene or 0.863 mg/gDCW after 48 h of cultivation. Optimization of the expressions of limonene biosynthesis genes in E. coli . For a full description of the polycistronic operons and the vectors, see Table 3. A: Total production (mg/L); B: Specific production (mg/gDCW); C: Cell mass (gDCW/L). The limonene building blocks, IPP and DMAPP, can be synthesized in E. coli via the endogenous MEP pathway. The reactions catalyzed by DXS and IDI have been reported as the most critical rate-limiting step in the endogenous MEP pathway of E. coli–. In this study, the polycistronic operon dxs-idi was constructed based on pTrcHis2B, pQE30 and pET21a + to form p40Trc-dxs-idi, p40T5-dxs-idi and p40T7-dxs-idi. These three plasmids were respectively introduced into the strain #2, resulting in another three strains designated as strains #13, #14 and #15. Then the strains #2, #13, #14 and #15 were cultured in 2YT medium for 48 h. Various inducer (IPTG) concentrations, from 10 μM to 500 μM, were also evaluated. 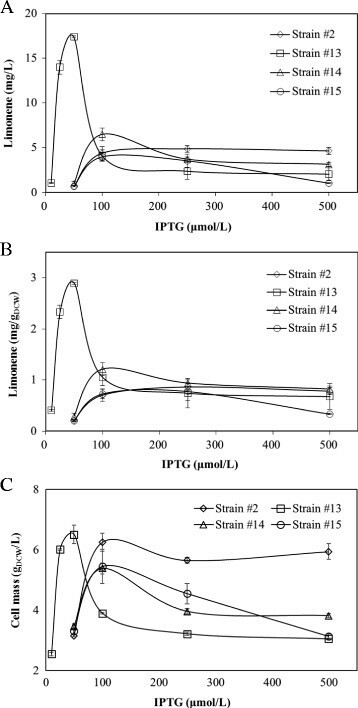 As shown in Figure 3, the strain #13 containing both plasmids p40T7-dxs-idi and p15T7-ls-gpps could accumulate limonene up to 17.4 mg/L (or 2.89 mg/gDCW) after 48 h cultivation with IPTG induction at 50 μM, which represents approximately a 3.6-fold enhancement in total limonene production (from 4.87 to 17.4 mg/L) or a 3.3-fold improvement in specific production (from 0.863 to 2.89 mg/gDCW). Meanwhile the cell mass was the largest. Additionally, limonene production significantly affected the cell mass and glycerol consumption (Figure 3C, D). Clearly, the higher productivity and more robust growth of strain #13 allowed higher limonene accumulation. Further improvements should be possible through medium optimization. Overexpression of two rate-limiting enzymes in the endogenous MEP pathway to supply building blocks. For a full description of the strains and their plasmids, see Table 3 and Table 1, respectively. A: Total production (mg/L). B: Specific production (mg/gDCW); C: Cell mass (gDCW/L). Besides the genetic modulation described above, we also optimized the growth medium to further increase the limonene productivity. E. coli strain #13 was respectively cultured in 2YT, LB or TB media. The limonene production was measured after 24 h, 48 h and 72 h cultivation. Although the three media had no significant differences in the specific production of limonene, 2YT medium gave higher titers than the other two media (Figure 4). So 2YT medium was chosen as the basis medium for the cultivation of genetically engineered strain #13. In a previous work , pyruvate and dipotassium phosphate were found beneficial for isoprenoid production in E. coli. Therefore, the 2YT medium supplemented with different concentrations of pyruvate was designed and employed for the culture of strain #13. As shown in Figure 5, addition of 4 g/L pyruvate could stimulate the limonene production of up to 15.1 mg/L or 4.11 mg/gDCW after 24 h cultivation, 32.5 mg/L or 5.59 mg/gDCW after 48 h, and 35.8 mg/L or 5.76 mg/gDCW after 72 h. Although the cell mass was basically the same (Figure 5, C), it is approximately a 2-fold increase in limonene production as compared with the un-optimized medium used in this work or a 7-fold increase in contrast to the initial titer (4.87 mg/L). Meanwhile, the consumption of glycerol was also the largest (Figure 5, D). In addition, the effect of K2HPO4 was also examined (data not shown), although the improvement was not so significant as pyruvate. Effect of culture medium on limonene production of the strain #13. A: Total production (mg/L); B: Specific production (mg/gDCW); C: Cell mass (gDCW/L); D: Glycerol in medium (g/L). 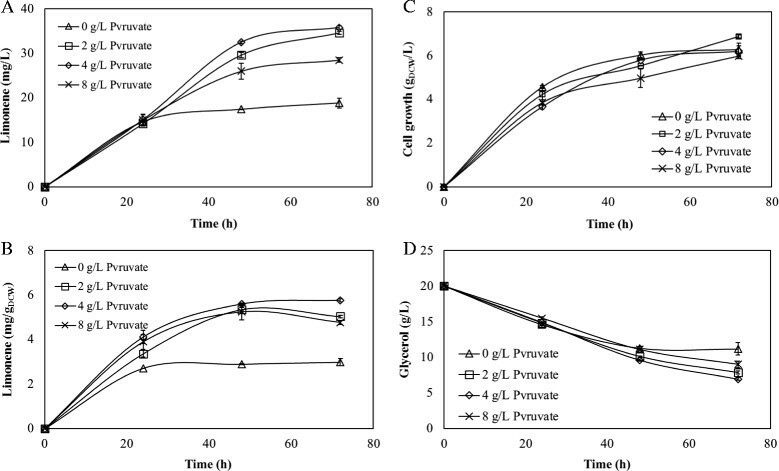 Effect of pyruvate concentration on limonene production of the strain #13. A: Total production (mg/L); B: Specific production (mg/gDCW); C: Cell mass (gDCW/L); D: Glycerol in medium (g/L). 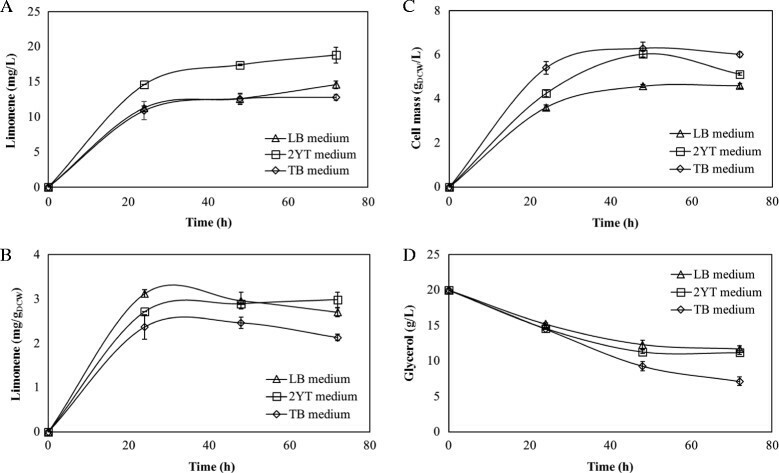 In this paper, we significantly increased the limonene yield in E. coli by optimizing the expression of the two limonene biosynthesis genes, overexpression of the two rate-limiting enzymes in the endogenous MEP pathway, and optimization of the culture medium (Figure 6). We established a limonene biosynthesis pathway in E. coli using four different polycistronic operons based on three vectors with varied expression strength. Previous researches on limonene biosynthesis focused merely on the expression of a certain polycistronic operon (e.g., gpps-ls) based on a specified vector ,. In addition, only the GPPS from plant Abies grandis was tried for limonene production ,. In this study, Ecgpps, a bacterial gpps gene that is native to E. coli, was tried for the first time for limonene production. Previous study indicated that limonene biosynthesis pathway flux was limited by the inherently low enzyme activity of the plant-originated GPPS . However, our result showed that the protein-engineered Ec FPPSS80F from E. coli also suffers a problem of low activity for limonene production. The two genes connected by IRES sequences can be expressed from a single promoter in IRES method used in this study. In the prokaryotic expression system, the gene ranked in front will be transcripted and translated primarily, followed by the transcription and translation of the subsequent gene in the polycistronic operons . So the order of the limiting genes in polycistronic operons has a lot to do with the expression of the genes and the quantity of final product ,,. Our result showed that those E. coli strains expressing ls-gpps or ls-Ecgpps produced larger amounts of limonene than the strains expressing gpps-ls or Ecgpps-ls. This result disputes the current notion that the order of the limiting genes in polycistronic operons should correspond to that of terpenoid metabolic pathway in the natural and fine regulation mechanism of microorganisms . In addition, the expression strength of vectors used for limonene biosynthesis was also indicated to be a very important determinant for the final limonene yield. Progressive enhancement of limonene production in E. coli. 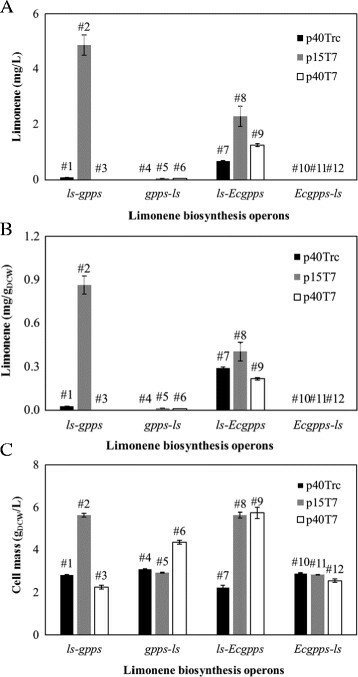 The limonene yield of E. coli was increased by three steps: Optimization of the limonene biosynthesis genes expression; overexpression of rate-limiting enzymes in the endogenous MEP pathway; and medium adjustment. Our work represents the first report on limonene biosynthesis via overexpression of rate-limiting enzymes in MEP pathway. When the two limiting genes (dxs & idi) were coexpressed, both the expression strength and IPTG concentration were very important for achieving a high limonene yield. The polycistronic operon dxs-idi was expressed on various vectors, which resulted in different limonene productions. This phenomenon was also reported in the researches on taxadiene and levopimaradiene biosynthesis ,. Once again, an appropriate expression strength of genes made tremendous contribution to the overall yield of the final product. Although a direct comparison of limonene yield with previous studies on isoprene or terpenoid is difficult because of the differences in products and assay conditions used, our results agree well with the published values of increases in isoprene or terpenoid yields when overexpressing enzymes of MEP pathway (Table 4). Although it might have become a popular point that the MEP pathway is not effective for high-level production of terpenoid ,, the MEP pathway is a native pathway and the stoichiometry of MEP pathway is more efficient as compared to MVA pathway for IPP/DMAPP synthesis . The limonene production by the MEP pathway in this work was much lower than the reported result by the MVA pathway . It was partly because only two bottleneck enzymatic steps (dxs and idi) were targeted to increase the flux through the MEP pathway. Previous work  revealed that ispB, ispD and ispF also produce rate-limiting enzymes impacting the MEP flux. Second, previous results showed that the expression of B. subtilis bottleneck enzymes in E. coli resulted in an enhancement of total isoprene production . The low enzyme activity and the native regulation of the native bottleneck enzymes might be the reasons of low limonene production in this work. Third, different E. coli strains might result in the difference in limonene biosynthesis. E. coli BL21 (DE3) might not be as suitable as E. coli DH1 for terpene biosynthesis . The rate-limiting enzymes in the MEP pathway were overexpressed in all the studies listed in this table. fThe gene of 2-c-methyl-d-erythritol 2, 4-cyclodiphosphate synthase. Besides genetic modulations, we also systematically optimized the culture medium to further increase limonene production. Pyruvate and dipotassium phosphate were chosen as supplements. The addition of pyruvate as the auxiliary carbon source has been reported to increase terpenoid production . Since pyruvate was the immediate precursor of MEP pathway, the addition of pyruvate greatly increased the DMAPP synthesis so as to significantly enhance the limonene production. In addition, the addition of pyruvate affects the main metabolism. Namely, keto-acid such as pyruvate, OAA, and 2KG etc. affect Cya and in turn affect cAMP level. In the case of using glycerol as a carbon source, cAMP-Crp level is high in the wild type, while this may be decreased when pyruvate was added, and thus the glycerol consumption rate may be affected, since glpFKD is under control of cAMP-Crp. Dipotassium phosphate was also found to be beneficial for limonene production in E. coli. It supports the results of the previous study on terpenoid biosynthesis . To prevent limonene volatilizing and to extract it from the culture medium, a two-phase culture system composed of n-hexadecane was adopted in this study. Hexadecane was chosen for its high hydrophobicity (log PO/W, 8.8) for the extraction of limonene, and low volatility, which prevents loss due to evaporation. A ratio of 1/50 (Vorg/Vaq, 2 mL of hexadecane was layered over 100 mL of culture broth) was adopted in this two-phase culture system. Limonene was extracted into the hexadecane phase, and negligible amounts of limonene were detected in the cell mass and culture broth (data not shown). As a result, limonene production was measured only from the hexadecane phase. The two-phase culture system using hydrophobic and low volatile organic solvent was a very useful and common method used in terpenoid biosynthesis ,,. Although the limonene production was enhanced significantly in this study, more efforts are still needed to achieve a higher production and to make it more economic. On one hand, the metabolic flux of the endogenous MEP pathway can be enhanced by overexpressing the rate-limiting enzymes from other bacteria such as Bacillus subtilis and/or blocking the competing metabolic pathways. On the other hand, the problem of low GPPS/LS activities needs also to be addressed by directed evolution or rational protein engineering. Besides, the culture medium should be more efficient and economic, and the metabolically engineered strain should be cultivated in a bioreactor for commercial production of limonene in the future. This work was financially supported by the National Natural Science Foundation of China (No. 21276082), Ministry of Science and Technology, P. R. China (Nos. 2011CB710800), and Shanghai Commission of Science and Technology (No. 11431921600). The authors are grateful to Dr. Yunpeng Bai for proof-reading of the manuscript and to professor Hongwei Yu at Zhejiang University for his generous gift of vectors and constructive advices. F-LD has made substantial contributions to conception and design, and acquisition of data, and analysis and interpretation of data; H-LY has been involved in drafting the manuscript and revising it critically for important intellectual content; J-HX has given final approval of the version to be published; C-XL has made substantial contributions to design and has been involved in drafting the manuscript and revising it critically for important intellectual content. All authors read and approved the final manuscript.